FEB. 16, 2015 UPDATE: Carmen has been released from the hospital, an update today on the Carmen Ledford Crowdrise page reports. “After almost two weeks of 24-hour care at Care Center, Carmen is strong enough to continue her recovery from home, with Ben’s brother, Phil and the watchful eye of the entire family,” according to the update. As of Feb. 16, more than $29,000 has been raised for Carmen’s veterinary care. 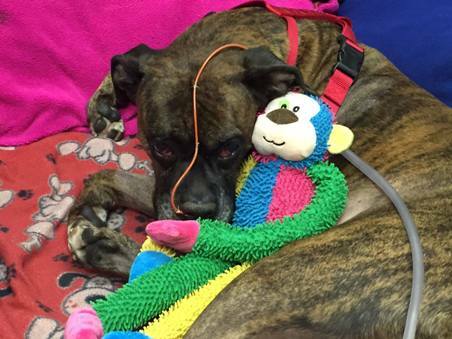 More than $28,000 has been raised to pay for the veterinary care of Carmen, a 9-year-old Boxer who suffered severe lung damage while trying to shield her dog dad, Ben Ledford, from a fire in a Goshen Township, Ohio, home Feb. 5. Unfortunately, Ledford did not survive. If not for the around-the-clock care by veterinarians at Care Center in Cincinnati, Carmen would likely have died as well. When firefighters arrived at the house, they found Carmen on top of Ledford in the basement, shielding his face from the thick, black smoke. Ledford was still breathing, but died a short time later at a hospital. Carmen was rushed to Care Center in critical condition, and placed on a ventilator to enable her to breathe. By Tuesday, she was able to breathe without the ventilator. “She’s doing very well. We’re very happy with where her progress is at this point,” Dr. Marlo Anderson, the hospital’s critical care specialist, told WCPO Feb. 10. Ledford’s sister, Emily Ledford, told WCPO Ben and Carmen adored each other. “There was nothing in this world that Ben loved more than Carmen and there was nothing that Carmen loved more than Ben,” she said. Her brother was a big Ohio State University fan, she said, and had named his dog after “Carmen Ohio,” the university’s alma mater. Dr. Anderson said she wasn’t too surprised by Carmen’s heroic act. “A lot of dogs instinctively know when there’s a crisis going on, so a lot of them do go to try to protect their owners, so she very well may have been trying to protect him,” she told WCPO. Carmen began physical therapy Wednesday, and continued to show signs of improvement during the week. “Carmen is coming off fluids and IV medications today,” wrote Care Center on its Facebook page yesterday. “She still requires oxygen support at this time as her lungs continue to heal. She is eating and drinking on her own and will have some more rehabilitation today. 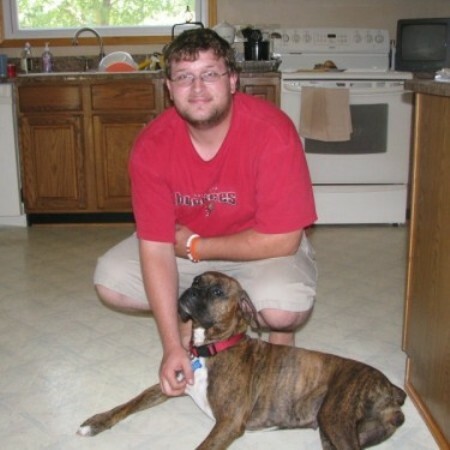 Phil Ledford will adopt his brother’s beloved dog when Carmen is ready to leave the hospital. For the latest updates on Carmen’s health, visit the Care Center Vets Facebook page.